One in four patients develop heart failure within four years of a first heart attack, according to a study in nearly 25 000 patients presented at Heart Failure 2016 and the 3rd World Congress on Acute Heart Failure. Risk factors included older age, greater socioeconomic deprivation, and comorbidities such as diabetes. The current study used prospectively collected electronic health records to investigate the contemporary incidence and risk factors for heart failure after a first myocardial infarction. “Finding which heart attack patients are most likely to get heart failure would help us target preventive therapies,” said Dr Gho. The study used data from the UK based CALIBER (CArdiovascular research using LInked Bespoke studies and Electronic health Records) programme. Primary care records were linked to hospital admissions and national registries on myocardial infarction and mortality. The researchers identified 24 745 patients aged 18 years or older who experienced a first myocardial infarction between 1 January 1998 and 25 March 2010 and had no prior history of heart failure. Patients were followed up for a median of 3.7 years for the first recorded heart failure diagnosis in any of the CALIBER sources. A number of factors were associated with an increased risk of developing heart failure after a first myocardial infarction. Every ten year rise in age was associated with a 45% increased risk. Greater socioeconomic deprivation (5th versus 1st quintile) was associated with a 27% increased risk. 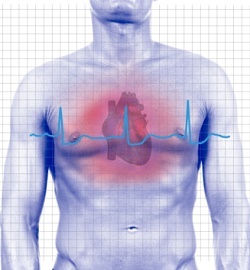 The following conditions were associated with a higher risk of developing heart failure after a first myocardial infarction: diabetes (44% increased risk), atrial fibrillation (63% increased risk), peripheral arterial disease (38% increased risk), chronic obstructive pulmonary disease (28% increased risk), ST elevation myocardial infarction at presentation (21% increased risk), and hypertension (16% increased risk).